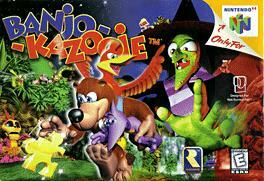 A bear named Banjo needs the help of his loyal friend Kazooie, a red feathered bird, to rescue his sister Tooty from a witch named Gruntilda. Gruntilda has created a machine that transfers one person's level of beauty to another, and plans to use it on Tooty, so she can steal her youthful good looks. Tooty is hidden within Gruntilda's lair, a strange collection of rooms that contain portals to mysterious environments, where new landscapes, new friends, and new foes are encountered. The layer contains magical doors that seal off certain rooms, stopping Banjo and Kazooie from finding Tooty. In order to open these doors, Banjo and Kazooie need to collect mysterious objects called notes, which exist within the mysterious environments. Collecting enough of these notes will give them the power to open the magical doors. In order to open a portal to a new environment, a jigsaw containing a picture of the environment has to be finished. Golden Jigsaw pieces are located within previously visited worlds, and can fit any unfinished jigsaw. The game is often described as being similar to Super Mario 64 and Donkey Kong Country, as well as sharing a few similarities with The Legend of Zelda series.